Daphné Budasz and Romain Duplan presented La Boîte à Histoire at the international conference on digital humanities organised by the Maison européenne des sciences de l’homme et de la société (MESHS) and the Luxembourg Centre for Contemporary and Digital History (C2DH). 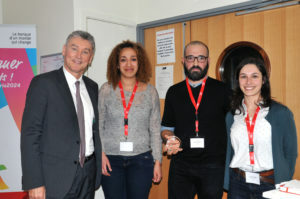 The project of La Boîte à Histoire has been selected as a laureate of the BNP Paris-UPEC prize for young entrepreneurs. Awarded projects receive financial aid for their future endeavours. UPEC published a summarising article (in French) regarding our project.